Learn from panelists as they share their export experiences, insights, opportunities and challenges from wide-ranging markets including Asia, Middle East and North America. This forum caters for all businesses, small and large, export-ready and aspiring. Following the Q&A session, access the panelists for one-on-one 15 minute sessions to discuss particular export areas of interest. Note that you must register your interest for these sessions during registration, and we will be in touch to confirm your place. Seating is limited; book now to confirm your place. Light lunch will be provided. We anticipate high interest in this event; to discourage no-shows, a cover charge of $25 will apply. Limited places: two per company. All attendees will also be entered into a draw to win a free report from Euromonitor International. 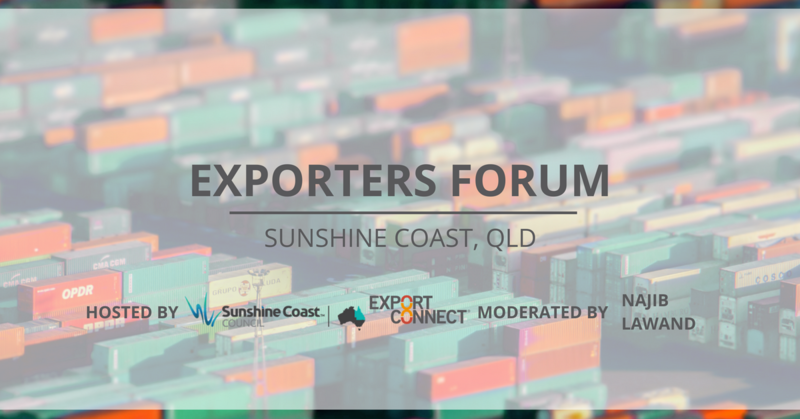 This event is funded by the Sunshine Coast Council and supported by Export Connect.